They're your Clacks. Use them when you need them! Or better yet for newbs, don't go down the dark path of clack hunting. Many times it brings out the worst in people. Look at what happens at CC sales. The heart wants what the heart wants. I'm just hoping that if people share stories about their experiences hunting clacks (good or bad) maybe we can all feel a little better about our struggles and hopefully gain some understanding to ease the tension and frustration at sale times. So please, share some stories/thoughts etc. The only clack I truly want is the red translucent one. Somehow I don't think I'll ever acquire it due to its rarity.. Milk blue mx. **** you milk blue you piece of filthy bloodied mucus filled elephant ****, I hope all the milk blues in the entire existence of the history of the universe are stuck up the ******* of a syphilitic grizzly bear who is raped by a great white shark, then **** out and smashed to bits by a an angry Margret Thatcher in cement high heels dressed as cookie monster on a Tuesday. Clacks are stupid anyways. Eh, I do feel a bit better. This made choke on my cereal. Pure awesome. I'd much rather have an auction where everyone has a chance to bid than a race to see who can pm the fastest when there is a set price. Oh, and I also hate when people criticize the people that are willing to spend big money on clacks. It's their money, they can spend if however they want. Maybe its just jealousy or something by I see posts like that far too often. TLDR; There is nothing wrong with clack auctions and people that spend big $ on Clacks should not be criticized. It's their your money, they can spend if however they want use it when you need it. Clacks are really nice, it would be awesome to have an entire keyboard of regular keys made with the same craftsmanship and material. isnt there a sail happening soon from clack factory? I'm gonna try to get my first one from there. I really don't mind the fact that I may never own a CC. 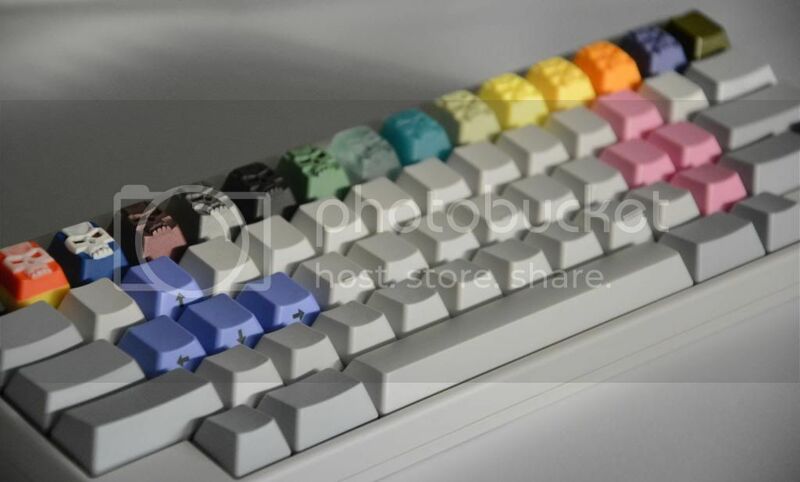 Honestly speaking, there's only 2-3 CC's I'd be interested in but will not buy because I will never drop that kind of money on a key cap, and that's the MX Juicysicle, Oktoberfest, and maybe the Candy Corn! It took me 4 months to get my first clacks since I refuse to pay markups. I got my Mint Green cluster and F2 Blue skull in various 4Grabs sales and my (first) Mint Green Skull from a cool person who sold to me at cost. No I'm not in some elite Clack club. I just started to talk to people and helped them hunt for stuff. And when they offered to do the same for me, I asked for a Skull and they found it. Like YM88 said, this isn't a store. Sometimes you have to be patient and you never know when someone will be kind and help you out. Just because you can't instantly buy it shouldn't be a turn off. And the fun of being on GH is meeting all these people while I hunt for swag I want. that's the MX Juicysicle Julysicle, Oktoberfest, and maybe the Candy Corn! You talkin' 'bout my Trifecta of DeliciousnessTM? Me love Salute. Me will never get a Salute (?) Me still okay with me. Introspection good. Thanks to OP for feeling talk place. After I snagged a bag with 3 F2 CC's, I gotta admit I'm addicted to these skulls. I definitely could use some therapy. lol. I actually got lectured by somebody who sold me a set of Clacks once: he told me that I had a sickness. But who is worse, the addict or the enabler? Wish I had dual colors like that. Hmm, well I have some doubles, but not on that keyboard. You can't really tell that the two yellows are not the same: there is a limoncello yellow and yolk yellow. I don't know what the big deal is with clacks. Its a lot like propaganda. Before coming to gh, anyone would be sane enough to not buy a key cap that costs 100. After coming to gh, after hearing all this rage about clacks, people tend to slowly justify spending 100 on a key cap. Rofl. You're right. I'm the reason why there's no Clacks to go to town. My bathtub is filled with them, Tai-Hao GB style, and I'm just swimming in them. 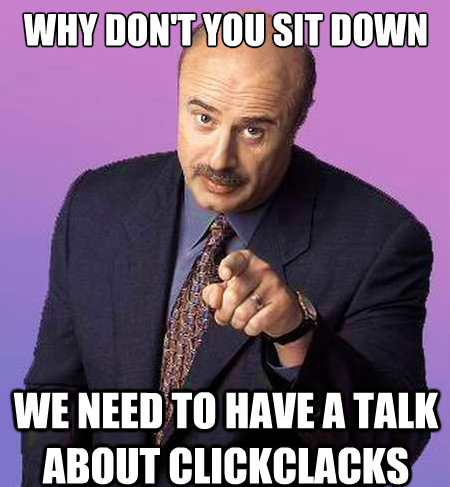 After coming to gh, after hearing all this rage about clacks, people tend to slowly justify spending 100 on a key cap. Definitely not true. I *refuse* to pay the markup. People are just impatient. We all know Team Twerk really runs the Clack underground. I can't help that Clack's gnomes like my moves. Yes you can. Stop moving. After coming to gh, after hearing all this rage about clacks, people tend to slowly justify spending [$] 100 on a key cap. 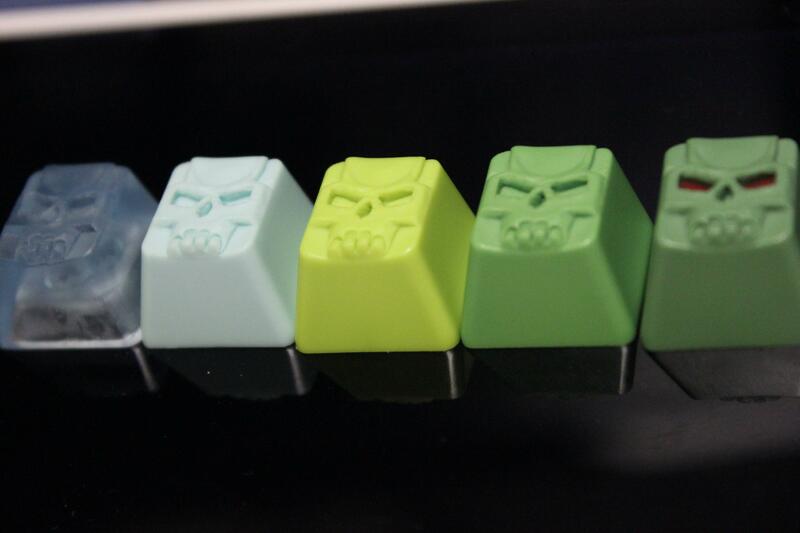 Where can I get Clacks for only $100? You got a stash? Sell them to me! its more than $100??? how can anyone justify spending that much on a single keycap??? Some people make lots of money and it's worth it to them instead of hoping to get one, they're willing to put the money on the table for one. I think it's ridiculous and I absolutely loathe the flipping Clacks for profit that goes on, but I can understand why some people are willing to pay that much. Now I just want someone to trade me for my Octopink Toast 4:20 cap. Only resale is that much. The price from clack himself during sales is normally around $25 or so. wow really? I thought they used to sell on EK for like 14? Can you grind it up and snort it? Page created in 0.16 seconds with 71 queries.